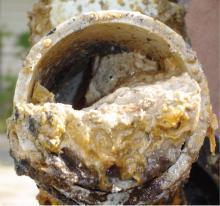 Maybe they are not quite as dramatic as the 10-ton bus sized fatberg that threatened to shut down part of London’s sanitary sewer system last year, but Jefferson County’s sanitary sewer lines also are plagued by blockages, courtesy of cooking oil and grease that wind up in kitchen sinks. Jefferson County has the responsibility to collect, transport and treat sanitary sewage/wastewater generated by 480,000 residents. Wastewater is collected from homes and businesses in a system of pipes which carries it to a wastewater treatment plant for cleaning before being released back into waterways. Unlike wastewater, stormwater runoff from yards, streets and parking lots drains to a separate system of pipes which empties directly into waterways without being treated. Wastewater is generated from activities such as flushing toilets, taking a bath or shower, washing clothes, preparing food, and cleaning. Day after day, year after year, this wastewater passes through Jefferson County’s 3,100 miles of sanitary sewer lines and is pumped by 170 pumping stations to 9 wastewater treatment plants. These treatment plants have a total capacity to treat 199 million gallons of sewage per day. There’s a lot that goes on in the treatment process, but here’s the short version: Sewage is screened, separated, aerated, filtered, and disinfected to meet state water quality standards before the resulting treated water is finally released into local waterways. Sanitary sewer lines are made to accept only wastewater, human waste and toilet paper. Anything else put into the system can cause some serious problems for homeowners as well as County maintenance crews. Personal care products such as wet wipes flushed down the toilet or cooking oil and grease poured down the sink can create blockages in the lines and cause sewage overflows. An easy way to prevent problems is to dispose of personal care products in the trash and recycle cooking oil and grease. Jefferson County offers a free and convenient recycling program with 20 drop off locations. Do your part to fight the fatbergs and keep the pipes beneath your feet running smoothly!